In a future where ignorance has destroyed the world that we know, humans are slaves and Mages - advanced beings with abilities beyond everyday reach - rule the land. Avalon is one such Mage. Barely eighteen years of age, she wields the gift of fire yet she is unable to control it. She leaves her family in the dead of night and heads to the city of Frost Arch, her future seemingly grim. Will Avalon be able to overcome the trials that befall her? Will she be able to save the ones she loves and stay strong within herself? 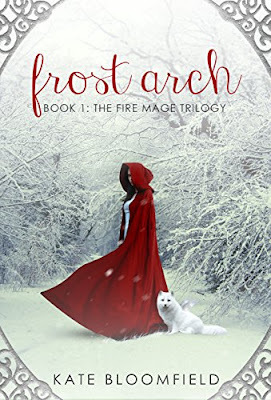 In this first book in the Fire Mage trilogy, Avalon Redding is a fire mage and she is dangerous. She doesn’t have control over her powers. After she burned her sister, who is human, she knew she needed to leave. Her parents couldn’t follow to find her. She hitched a ride to Frost Arch with a local named Jefferson. She frees some animal cargo on the way there. When she reaches Frost Arch her powers are labeled then she gets a job lighting fires for one of the main families. Things go well for the first dew weeks. She gains some control over her fire, makes friends with Jack and Camryn. However, catching the attention of Seth Swaggart is not what she needed. Rumors are he curses people and it looks like she is next. Then she realizes the animal she freed, stayed in her bag. The small baby white fox with wings is odd but she refuses to let it suffer. She names him Hawthorne and claims him as her own. She secretly takes care of him until he grows too big. Camryn and Jack step into help with him. Everything changes when the prodigal son arrives home. Ava ends up forming a friendship with him against all who warn her to stay away. Secrets are abounding as Ava learns the truth the hard way, then she loses her fire. When Hawthorne is taken away, she decides she has had enough. Time to fight, then go home. I liked this book. The magical world the author developed was pretty fascinating. Mages run the world and humans are slaves. I wondered as I read this story what happened to allow this to occur. When Ava arrives at Frost Arch, it is obvious that Elvira Frost is a dictator. You don’t know mush about her at first except her laws. I was not surprised how her character ends up in the end. I liked the ending. Ava was awesome finally coming into herself and her power. It was epic for a fire mage. I also liked the bonds she formed with Jack and Hawthorne. The three of them together were my favorite part of the story. I loved how the author threw them together and how the story unfolded around them. The three of them figured out what needed to be done and attempted to do it. The social hierarchy in this story is a bit medieval with the four main families. I can’t wait to see what happens next. The ending of this book opens a lot for the next book. I give it a 4 out of 5.